Once in a while we come across items that fill multiple ergonomic functions. 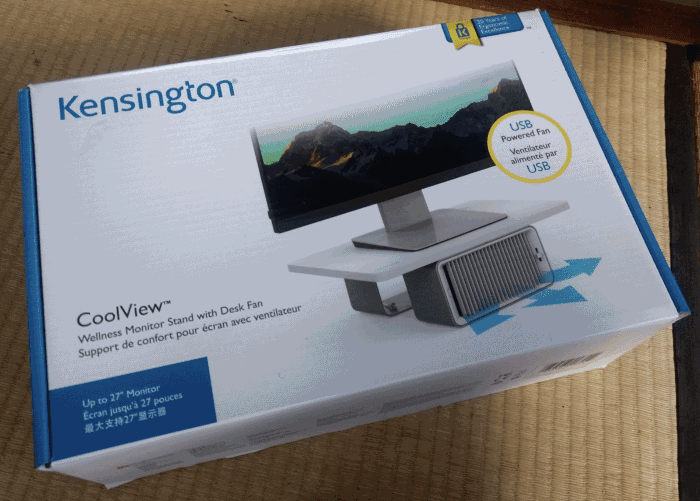 The Kensington Cool View Wellness Monitor Stand with Desk Fan is one of them and off the bat we like what we see! If you are using an all-in-one-computer, a laptop without a stand, or an external monitor without a stand, read on to see if you should consider getting this ergonomic stand. This stand has a steel-base and specifications say it can support monitors and computers up to 27”, up to 200 pounds. We have found most stands to only support the weight of laptops. Our tester went beyond these specifications and set up a 32” monitor and had no problems with stability, even after he rocked his desk back and forth. It’s strong enough and stable enough to handle computers and displays larger than the specifications suggest. 200 pounds, by the way, is overkill. But if you happen to have an old 32” CRT which can weigh 200 pounds, this stand should be strong enough to support it. With the montor now on the stand, the screen is at an ideal height for him. He mostly uses the external monitor so this stand creates a more ergonomic environment overall and his immediate reaction was one of increased display comfort. In addition to improving your ergonomic height for your computer or monitor, this unit has a unique USB powered, two speed fan. You may not need more cooling at your desk but for those that do, a gentle constant breeze may be enough to keep cool. The fan has one button to turn the unit on, off, and cycle through the two fan speeds. At the lower speed, the fan noise blends well into the background. At the higher speeds, it’s noticeable but not irritating. The fan also has a level to adjust the wind flow up or down. It doesn’t adjust much but adjusts enough for a desk fan. Our tester noted that the low speed setting has more than enough cooling power for an individual. 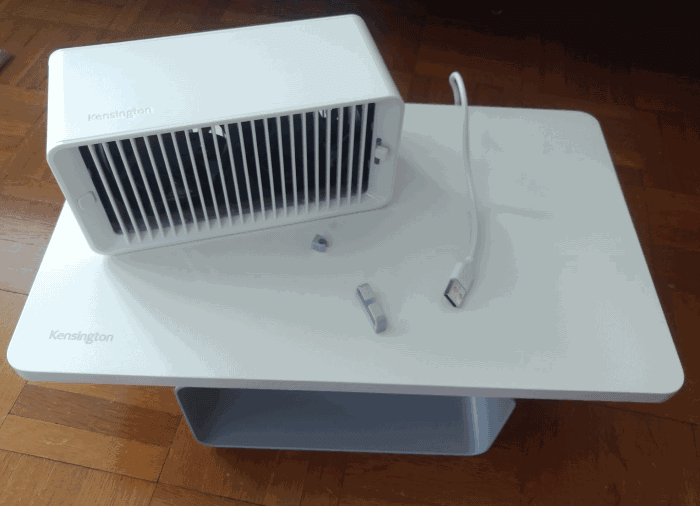 The fan slots and sits in the stand though it is removable so you can also use the fan elsewhere on your desk. 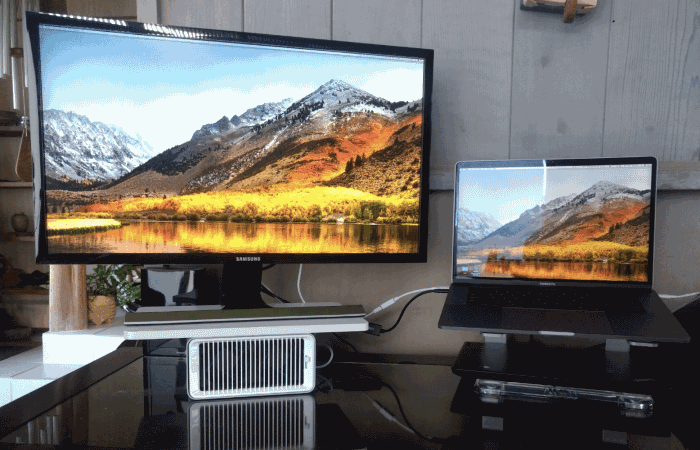 We tested the fan plugged into a USB in a monitor, in a computer, and a USB hub. All worked fine so we are assuming you do not need to use a high power USB port to run this fan. The last feature to point out is this stand comes with two magnetic cord management clips that you can place anywhere on the steel base. You can see the clips in the picture above. 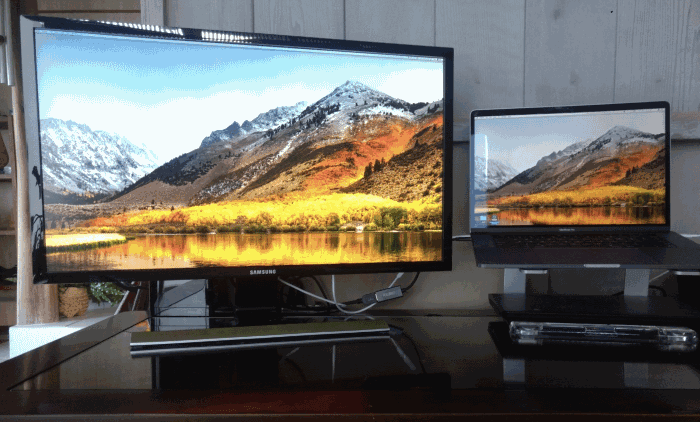 You can fit a few USB cords through these clips if you want to tidy up your deskspace. Our tester didn’t use the clips. He said the fan hides the one USB cord well. Our tester is not giving this one back! He has made this unit a permanent part of his desk and has passed on a very positive review. He said the fan is a pleasant surprise feature that he actually uses often. In fact, he had a floor fan that he stopped using and relies on this little USB fan. Our takeaway is to consider propping up your computer or monitor to a proper, ergonomic height. If you already have something that works, you don’t need to consider another product. If you don’t have one, this is an excellent universal option that is strong enough for nearly any desktop computer, something you won’t find in many other stands that have weight limitations.